Update 24/7/2013 - I have bought another lid as we have a number of items needing 24cm lids. 1029 customers found this review helpful. Did you? Yes, I did! 991 customers found this review helpful. Did you? Yes, I did! Excellent! Fits the pan perfectly! Excellent quality. Great customer service. Fine lid A wonderful fit on the 24 cm pan and saute pan. The good fit retains moisture where a good simmer is needed without losing liquid to evaporation. Looks good too! 973 customers found this review helpful. Did you? Yes, I did! Well fitting and beautiul Though the lid is large, it's still nice and light and fits snuggly on the pan. The handle also stays nice and cool, and is very well-rivetted, so no chance of loosening. 24cm lid It's a lid, ! But not just any lid. It's a Falk pan lid of course. Good snug fit, looks good like the rest of the range, fits several of our pans so you can get away with only one lid of this size. Just sets off the other pieces nicely especially out of the oven to table centre piece. Perfect fit for my Stew pot Like my stew pot, the lid gets pretty much daily use. It is lovely, solid and has richened in colour to a deep bronzy copper. Sadly I accidentally dropped my stainless steel coffee perculator on it and it now has a character dent:-( Makes it mine all the more. 937 customers found this review helpful. Did you? Yes, I did! Pretty little lid Great lid :) Excellent condition. 24cm lid for my casserole, saucier and frying pan I wanted to have lids for our pots mainly to avoid moisture loss and speeding up the heating. I have noticed the lid does not completely "seal" the pot which in a sense is good to let the expanding vapours to escape the pot. 919 customers found this review helpful. Did you? Yes, I did! Best birthday gift ever! 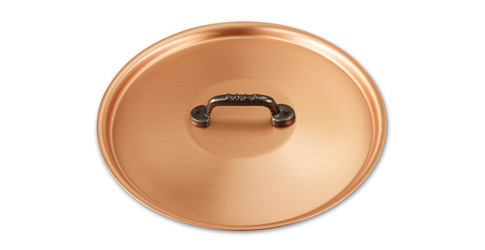 Beautiful pinkish copper lid. I use it both for the saute pan and the casserole. Good snug fit I like my dishes with matching n fitting lids. Over the years, I have realised that there is no point scrimping on the lid. A lid that fits does a fab job. It helps when it causes the cauldron to look stunning on the dining table. Any falk pan can have a perfect lid! I am very happy any falk pan can have a perfect lid! This is perfect for a 24cm pan! Beautiful brushed finish as same as cookware! It is a quality and durable lid! It's only a lid, but.... It's the best darn lid I have owned for a 24cm pan. Complements the wonderful cauldron I got and keeps in all the meaty goodness. And it goes onto the 24cm frying pan also, so it may seem expensive but how often ya gonna use the same size pots? 895 customers found this review helpful. Did you? Yes, I did! nice lid This lid complements the 24cm sauté pan very nicely and makes the pan more versatile. A great cover for all the 24cm pans I purchased this along with a 24cm Casserole. Its great at retaining moisture allowing longer cooking without items drying out. 24cm Copper Lid I like the conductivity of this copper pan and it seems the product will be durable. However, the only concern I have is the way the exterior shinning copper faded away. 767 customers found this review helpful. Did you? Yes, I did! Excellent Lid Covers the 24cm rondeau perfectly! Gorgeous Ordered this for my husband's birthday. He's not used it yet so can't comment on that but can say it looks stunning and is very weighty. 743 customers found this review helpful. Did you? Yes, I did!